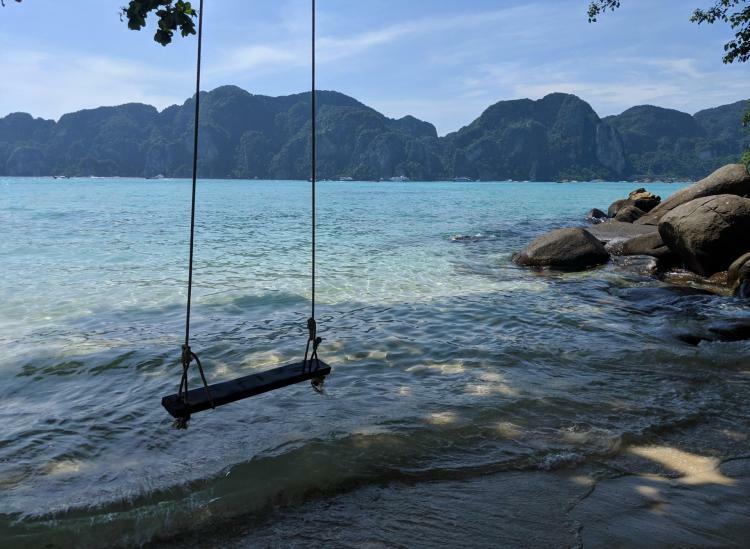 Looking for a swimming spot on the Koh Phi Phi islands? We know where you should go: Long Beach. It sounds boring and basic, but in reality, it’s anything but. Long Beach is one of the most sparkling, clear and magical beaches we’ve seen. And it’s quite the trek from the main pier to reach the beach, including passing tempting swimming holes, rope climbs and beach bars. You can reach Long Beach via a long tail boat, but we suggest the hike. Starting from Tonsei Pier, it’ll take you about 45 minutes to reach the beach… and that’s if you make it straight there. We dare you to try to do the hike directly. We bet you can’t resist checking out some of the viewpoints and attractions along the way. 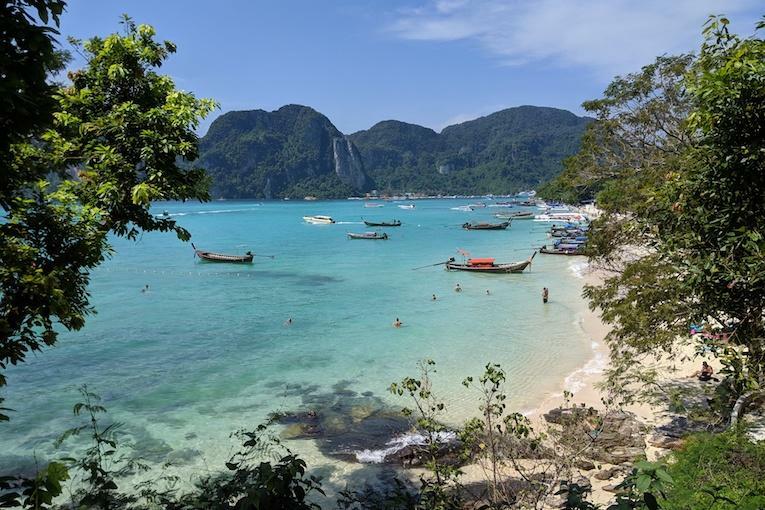 The first showstopper you’ll pass is a view of the port of entry to Phi Phi, the wide blue bay with towering green mountains in the background. 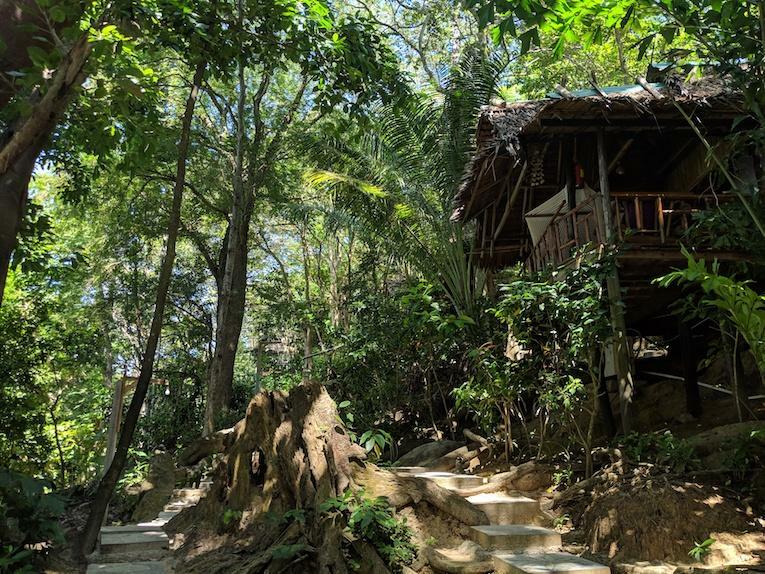 From there, you’ll be led along a path through the jungle with multiple beaches beckoning. If you can, we suggest holding out for Long Beach for your first dip. But make a list of stopping spots for the walk back. You know when things get really dense and jungle-like that the beach is coming up. The path turns from pavement to beach sand to a rocky walk and finally leads down a steep hillside where there’s a rope attached to the top to help climbers reach the sand. Careful on the descent — we know you’ll want to race straight into the water. Once in the perfectly clear depths, you might see some other creatures swimming around with you. 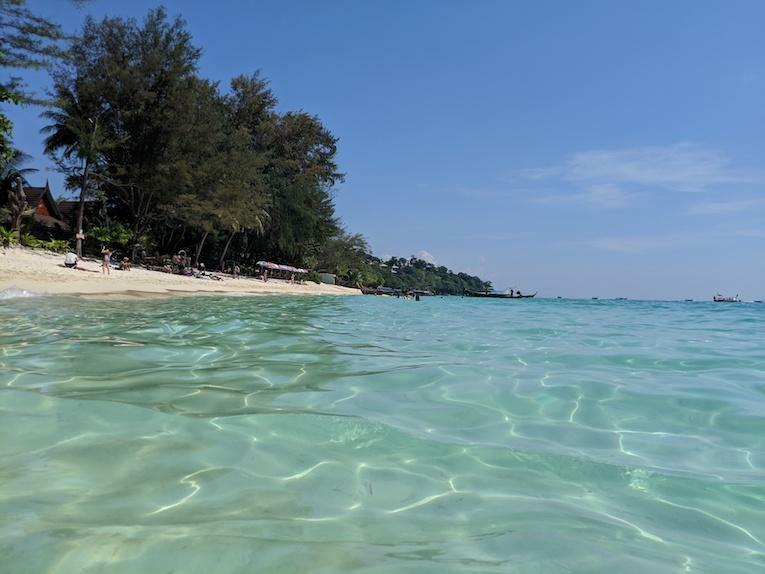 We had little Nemo-like fish under our toes and, if you’re into snorkeling, you can paddle out to a spot prime for shark spotting. Heads up: This walk is hot in the direct sun and, when you’re in the jungle, it gets buggy. So pack both sunscreen and bug spray. 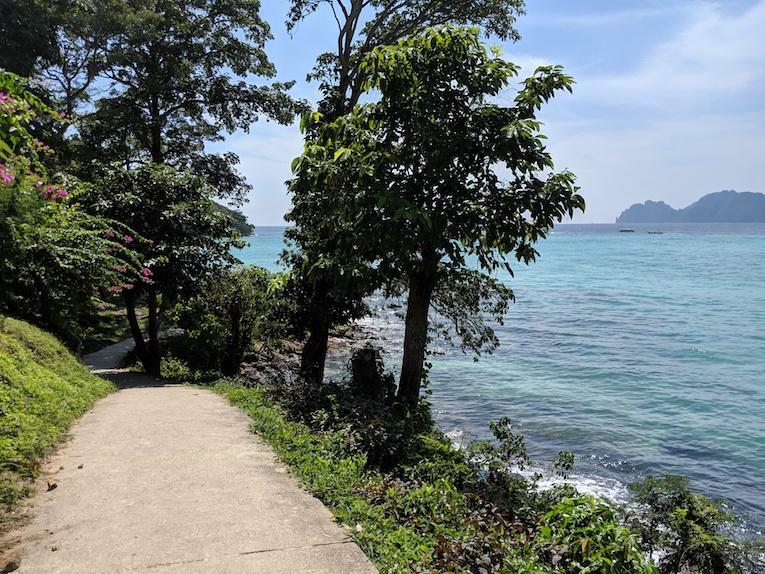 There are also resorts along the walkway leading to the beach and tucked into the jungle behind the beach. Some are pricey luxury splurges, while some are more affordable. If you get hungry at the beach, you can grab a snack from a vendor (we suggest a pineapple fried rice or a coconut smoothie) or dine at one of the restaurants at a resort. If you want to picnic, you can bring food from the main town for refreshments after your hike and swim.